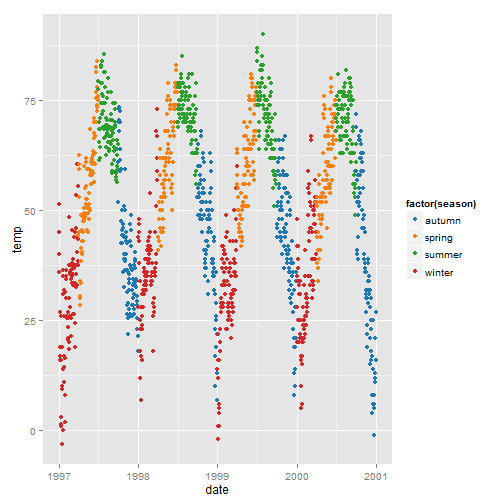 Even the most experienced R users need help creating elegant graphics. The ggplot2 library is a phenomenal tool for creating graphics in R but even after many years of near-daily use we still need to refer to our Cheat Sheet. Up until now, we’ve kept these key tidbits on a local PDF. But for our own benefit (and hopefully yours) we decided to post the most useful bits of code. 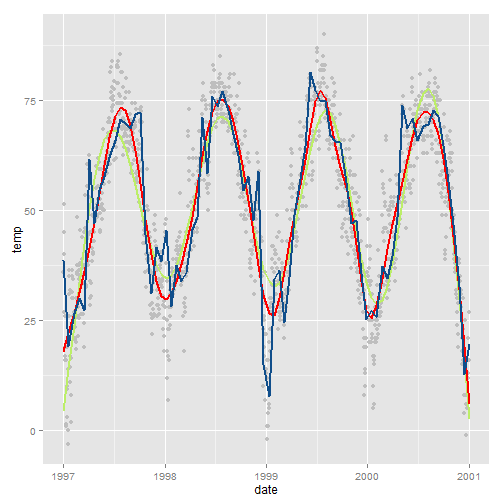 We start with the the quick setup and a default plot followed by a range of adjustments below. We’re using data from the National Morbidity and Mortality Air Pollution Study (NMMAPS). 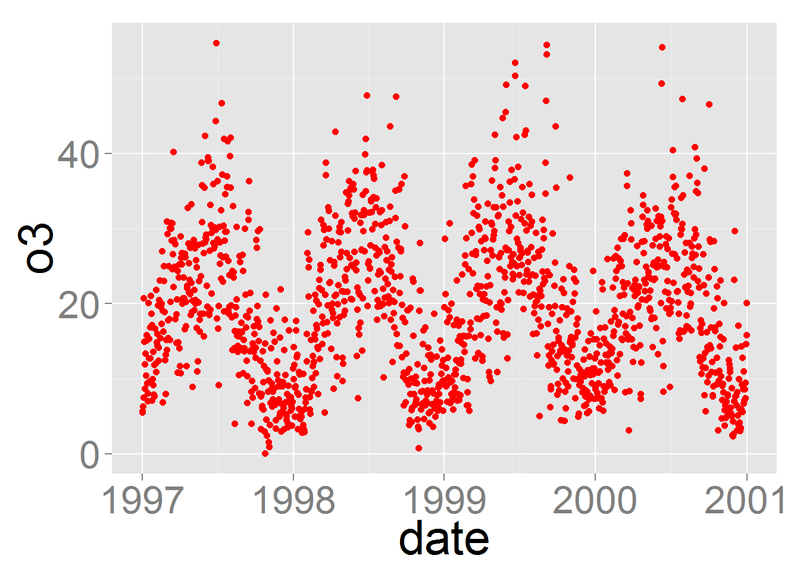 To make the plots manageable we’re limiting the data to Chicago and 1997-2000. 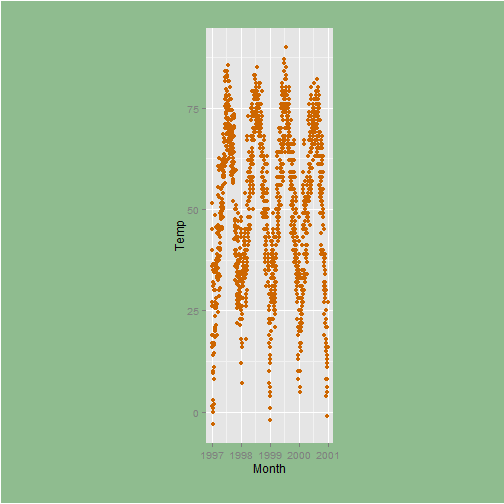 For more detail on this dataset, consult Roger Peng’s book Statistical Methods in Environmental Epidemiology with R.
You can also download the data we’re using in this post here. 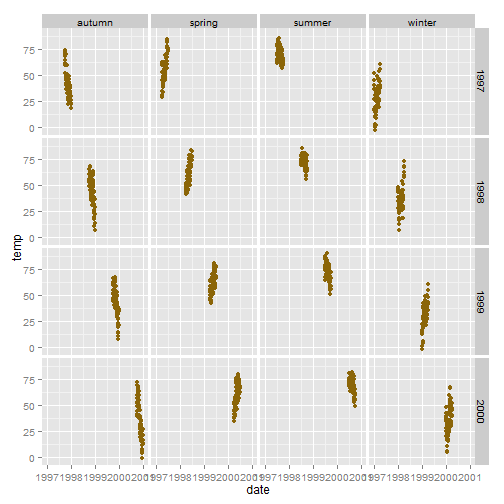 In ggplot2 versions before 2.0 I used the vjust argument to move the title away from the plot. With 2.0 this no longer works and a blog comment (below) helped me identify an alternative using this link. The margin argument uses the margin function and you provide the top, right, bottom and left margins (the default unit is points). Note that you can also use different fonts. It’s not as easy as it seems here, check out this post if you need to use different fonts. This may not work on a Mac (send me a note and let me know). If you are having trouble with this you might take a look at this StackOverflow discussion. You can use the lineheight argument to change the spacing between lines. In this example, I’ve squished the lines together a bit (lineheight < 1). Go ahead, try to say ‘tick text’ three times fast. I find that the labels are too close to the plot in the default settings so, similar to with the title, I’m using the vjust argument. Alternatively: g+scale_x_continuous(limits=c(0,35)) or g+coord_cartesian(xlim=c(0,35)). The former removes all data points outside the range and second adjusts the visible area. There must be a better way than this. 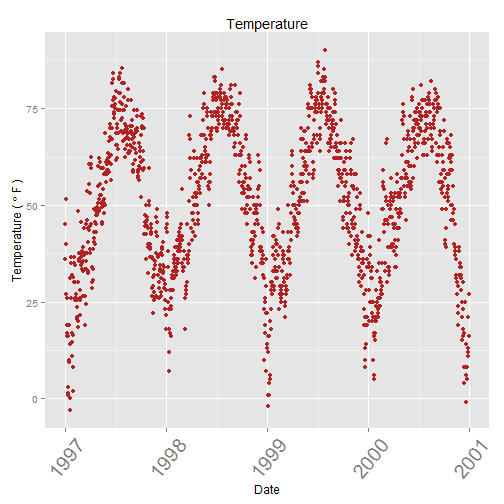 In the example, I’m plotting temperature against temperature with some random noise (for demonstration purposes) and I want both axes to be the same scale/same range. Not pretty here, but this can come in handy. We will color code the plot based on season. You can see that by default the legend title is what we specified in the color argument. To change the title of the legend you would use the name argument in your scale function. If you don’t use a `scale` function you will need to change the data itself so that it has the right format. I have mixed feelings about those boxes. If you want to get rid of them entirely use fill=NA. You can use show_guide=FALSE to turn a layer off in the legend. Useful! We can force a legend by mapping to a “variable”. We are mapping the lines and the points using aes and we are mapping not to a variable in our dataset but to a single string (so that we get just one color for each). We’re getting close but this is not what I want. I wanted grey and red. To change the color, we use scale_colour_manual(). Now let’s add extra space to both the left and right. The argument, plot.margin, can handle a variety of different units (cm, inches etc) but it requires the use of the function unit from the package grid to specify the units. Here I’m using a 6 cm margin on the right and left. 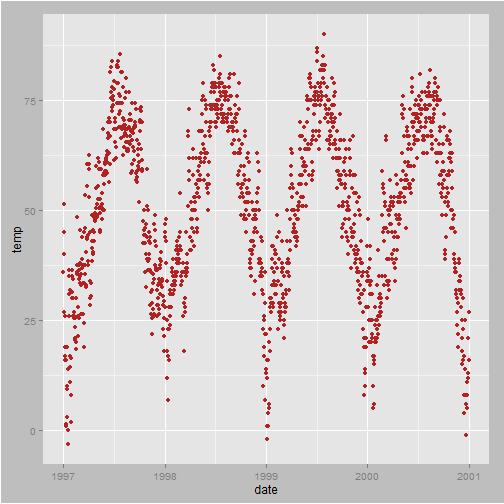 Again, not a pretty plot! 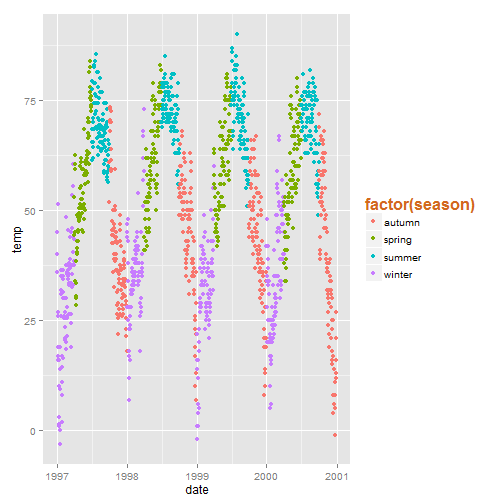 To change from row to column arrangement you can change facet_grid(season~year) to facet_grid(year~season). If you want to change the theme for an entire session you can use theme_set as in theme_set(theme_bw()). The default is called theme_gray. If you wanted to create your own custom theme, you could extract the code directly from the gray theme and modify. Note that the rel() function change the sizes relative to the base_size. 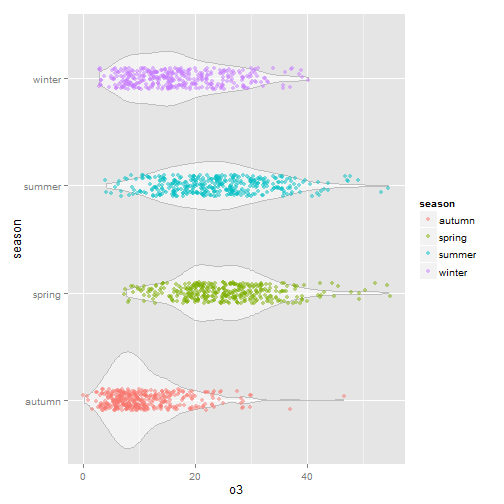 For simple applications working with colors is straightforward in ggplot2 but when you have more advanced needs it can be a challenge. For a more advaned treatment of the topic you should probably get your hands on Hadley’s book which has nice coverage. 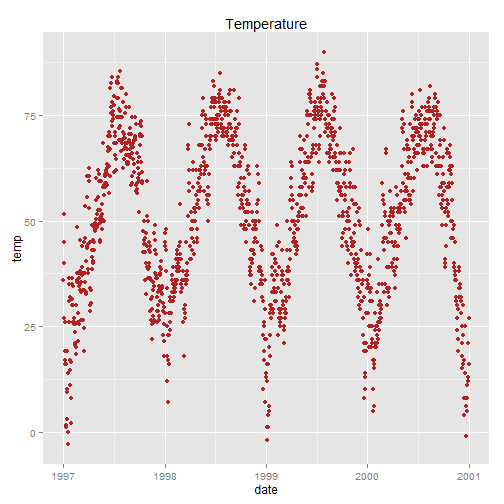 There are a few other good sources including the R Cookbook and the ggplot2 online docs. 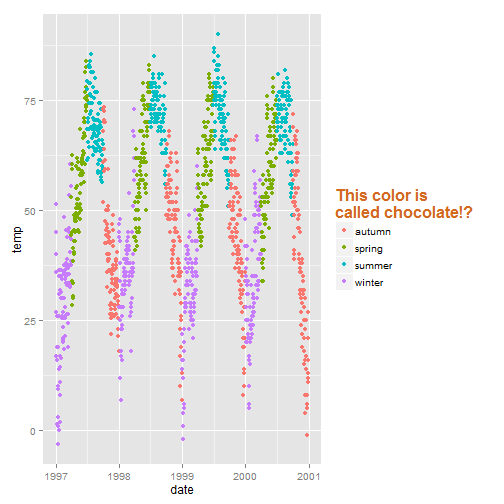 Tian Zheng at Columbia has created a useful PDF of R colors. In order to use color with your data, most importantly, you need to know if you’re dealing with a categorical or continuous variable. In our example we will change the color variable to ozone, a continuous variable that is strongly related to temperature (higher temperature = higher ozone). The function scale_color_gradient() is a sequential gradient while scale_color_gradient2() is diverging. 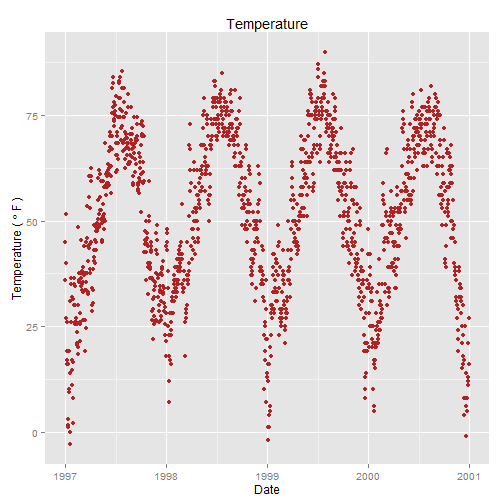 The temperature data is normally distributed so how about a diverging color scheme (rather than sequential). For diverging color you can use the scale_color_gradient2 function. 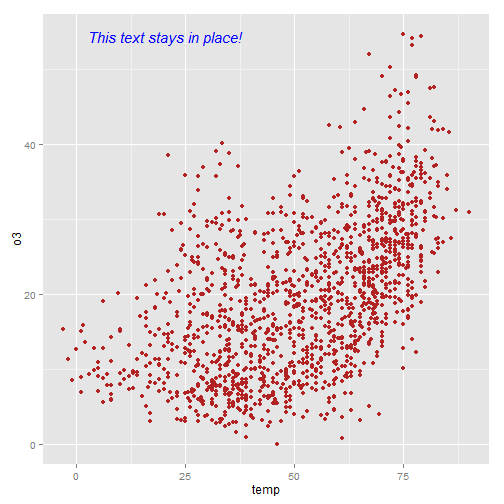 I often have trouble figuring out the best way to add text to a plot in say, the top left corner, without using hard-coded coordinates. 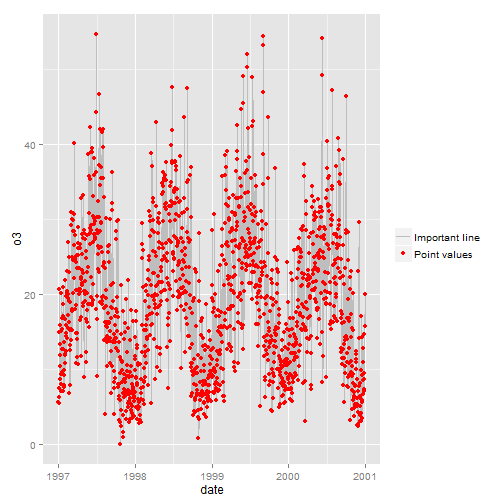 With ggplot2 you can set annotation coordinates to Inf but I find this only moderately useful. Here is an example (based on code from here) using the library grid that allows you to specify the location based on scaled coordinates where 0 is low and 1 is high. The grobTree function (from grid) creates a grid graphical object and textGrob creates the text graphical object. 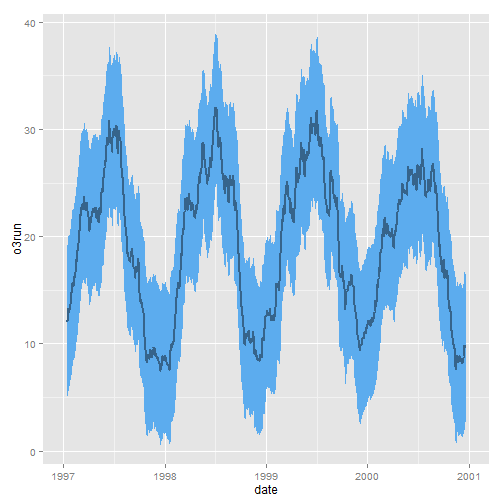 The annotation_custom() function comes from ggplot2 and is designed to use a grob as input. ‘Big deal’ you say!? It is a big deal. 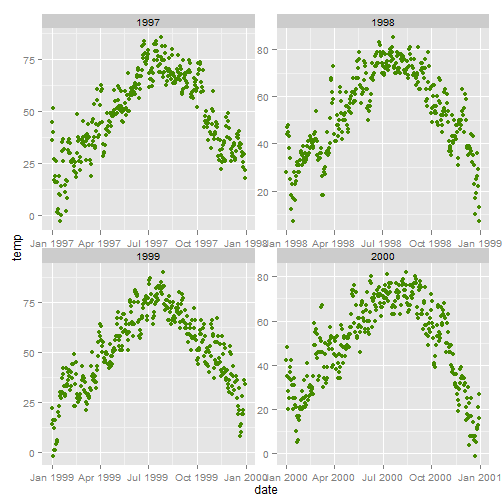 The value here is particularly evident when you have multiple plots with different scales. In the plot below you see that the axis scales vary yet the same code as above can be used to put the annotation is the same place on each facet. Nice! It is incredibly easy to flip your plot on it’s side. 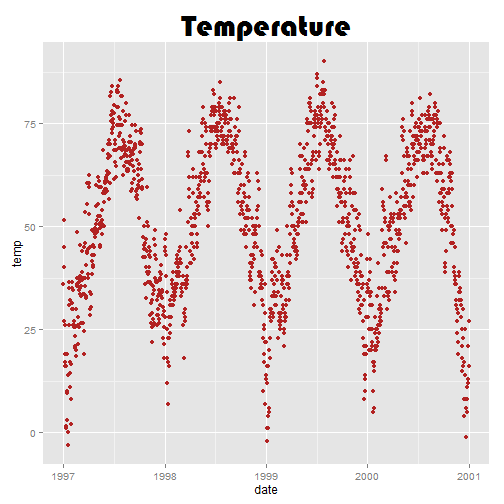 Here I’ve added the coord_flip() which is all you need to flip the plot. What if we plot the points themselves? 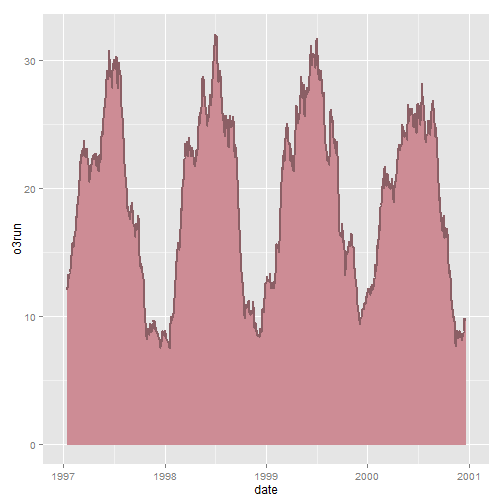 Not only boring but uninformative, you could add transparency to deal with overplotting, but this is not good either. Let’s try something else. 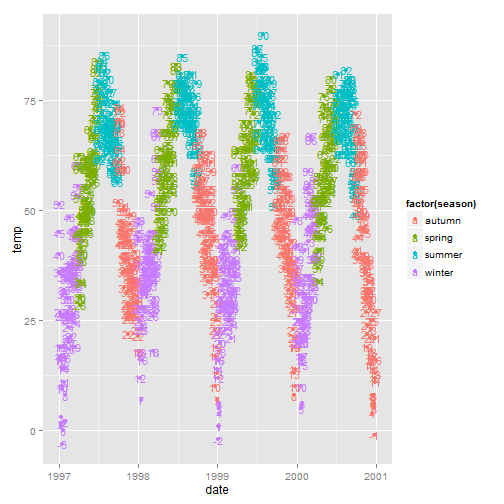 Try adding a little jitter to the data. I like this for in-house visualization but be careful using jittering because you’re purposely adding noise to your data and this can result in misinterpretation of your data. This is better and I think since we’re working with season, a variable everyone will be familiar with, the extra noise will not likely lead to confusion. 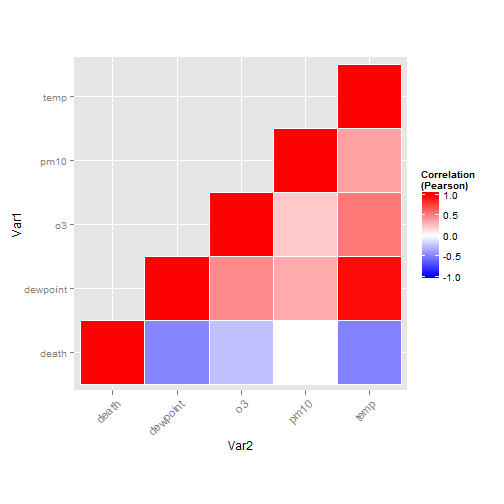 Violin plots, similar to box plots except you’re using a kernel density to show where you have the most data, are a useful visualization. What if we rotated and added the jittered points. This is nice and I like it. 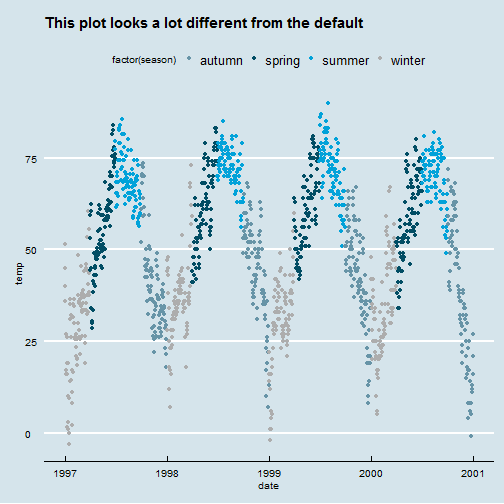 But be wary of using unusual plot types, they take more time for your users to understand. 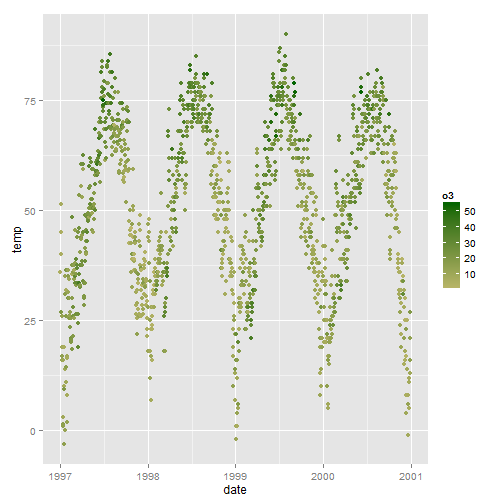 Sometimes the simplest and most conventional plot type is your best bet when sharing with others. 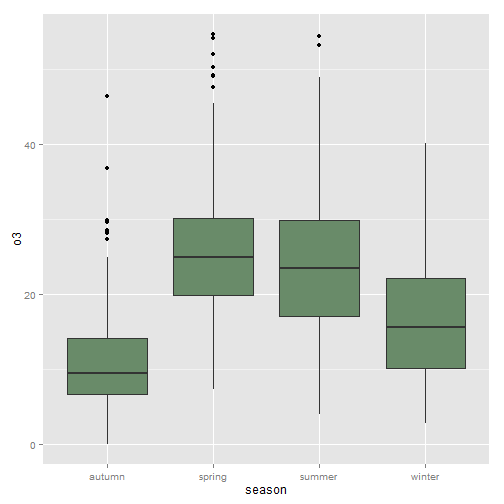 Box plots may be boring but people know how to interpret them immediately. 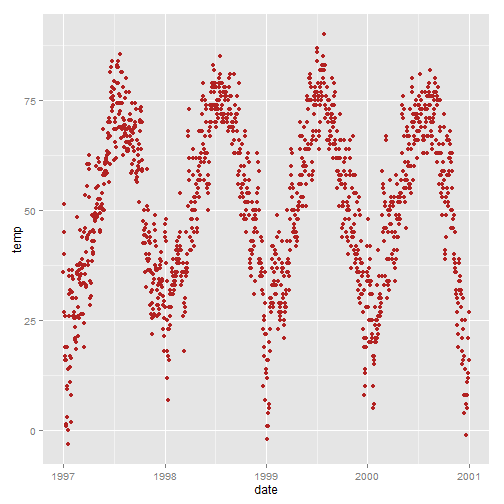 This is not the perfect dataset for this, but using ribbon can be useful. 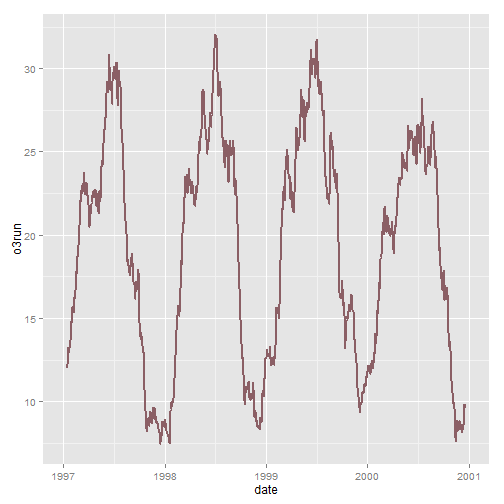 In this example we will create a 30-day running average using the filter() function so that our ribbon is not too noisy. How does it look if we fill in the area below the curve using the geom_ribbon() function? 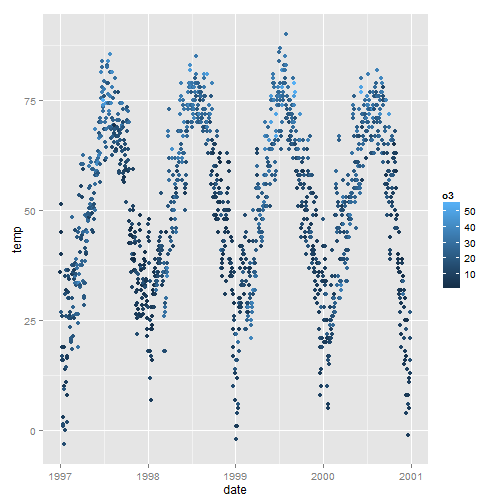 I’ll admit that I find creating tiled correlation plots a bit cumbersome, I always have to copy and paste code from a previous project. 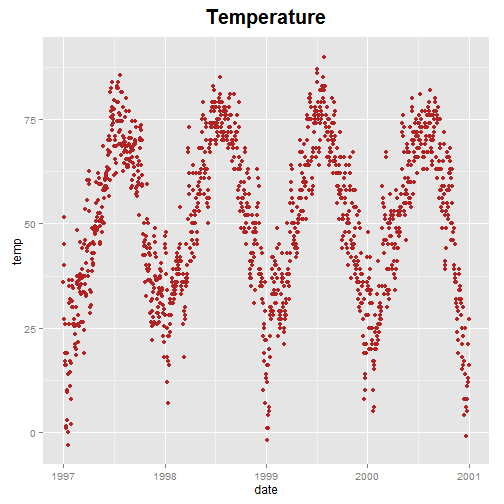 Nevertheless, it’s a useful plot type so I’m posting the code here. First step is to create the correlation matrix. I’m using Pearson because all the variables are fairly normally distributed – you may want to consider Spearman if your variables follow a different pattern. Note that since a correlation matrix has redundant information I’m setting half of it to NA. Now I’m going to put it in “long” format using the melt function from the reshape2 package and I’ll drop the records with NA values. Now for the plot. 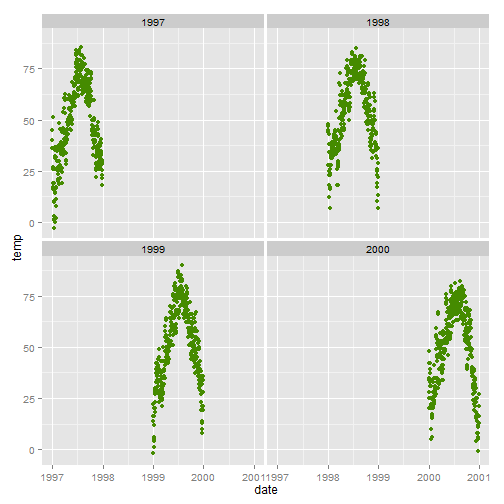 I’m using geom_tile but if you have a lot of data you might consider geom_raster which can be much faster. 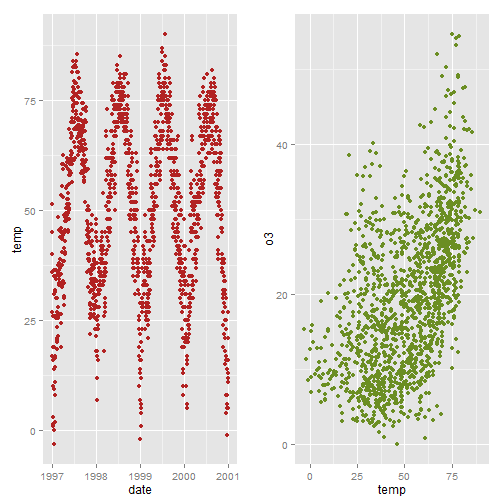 You’ve likely already learned how amazingly easy it is to add a smooth to your data using ggplot2. You can simply use stat_smooth() which will add a LOESS smooth if you have fewer than 1000 points or a GAM otherwise. Since we have more than 1000 points the smooth is a GAM. 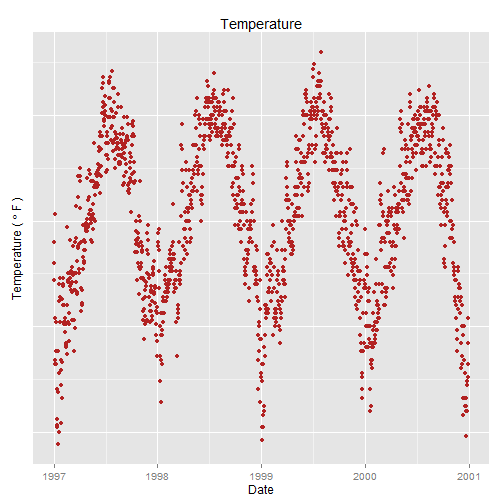 Plot.ly is a great tool for easily creating online, interactive graphics directly from your ggplot2 plots. The process is surprisingly easy, and can be done from within R, but there are enough steps that I describe how to create graphics like the one below in a separate post. Note that I have been using a free plot.ly account for this one plot which limits to 500 views per day. After 500 views plot.ly sends an incredible number of e-mails about the exceedance (sometimes more than 15 per day). So for now I have turned off the plot below and you’ll have to imagine it! 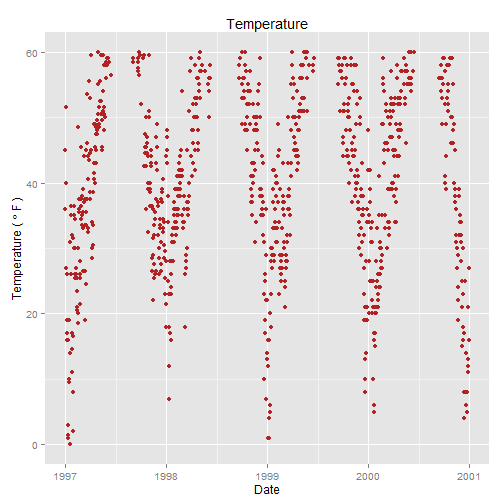 This post created in RStudio using knitr. 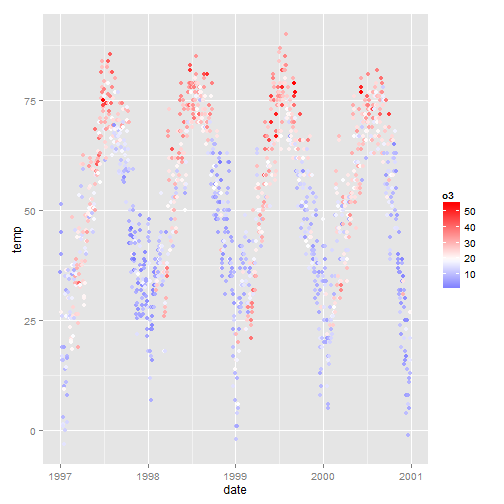 R version 3.0.2 (2013-09-25) and ggplot2 version 0.9.3.1. Looking forward to the ggvis version! Awesome job! 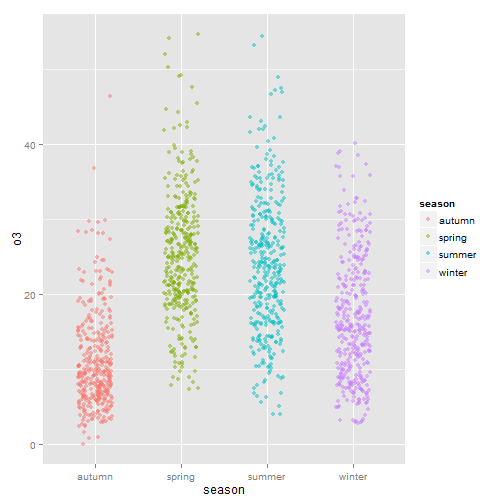 One of the most comprehensive tutorials on ggplot2 I’ve ever come through. By the way, how can you increase the size of x- & y-axis legend? Sorry if I missed it in your post. Thank you so much! Do you mean the x & y axis label? If so take a look at my “Move the labels away from the plot” and then look at the help for element_text (?element_text). I meant the size of numbers on x- & y-axis e.g. 0, 25, 50, 75 & 1997 to 2001 in your plot. Thanks! Hi, this looks really good, but I am not sure how to get hold of the data you are using. Any hints apart from consulting Dr Peng’s book? 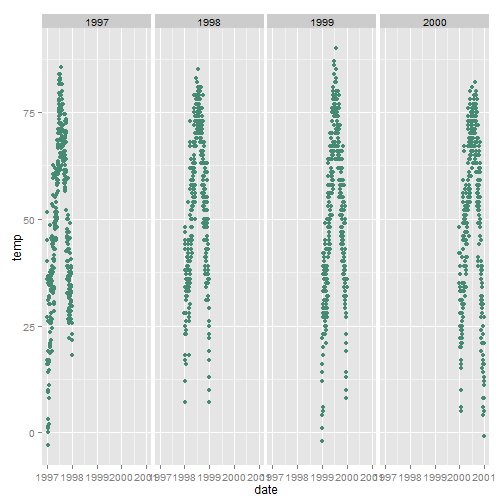 I added a link to the CSV file used in the post. in the section adding a linear fit. You are my new R hero. I have ~ 14,000 points for my XY scatter, so I have to necessarily use low alpha=0.025 or it will become too dark. However, when I want to display just 7 points of interest, they are not visible because of the low alpha. I am assuming that it is possible to retain alpha for the XY scatter points, and change alpha for just my points of interest? I just dont know how though, could you help please? Thanks! Once you have the code worked out, send it to me and I'll post. Thanks a lot for this fantastic cheatsheet! Wow… This is just wonderful, you must be from another planet because it takes patience and skills to explain the way you did. Thank you, i really appreciate this !!! The vjust and hjust arguments are deprecated. 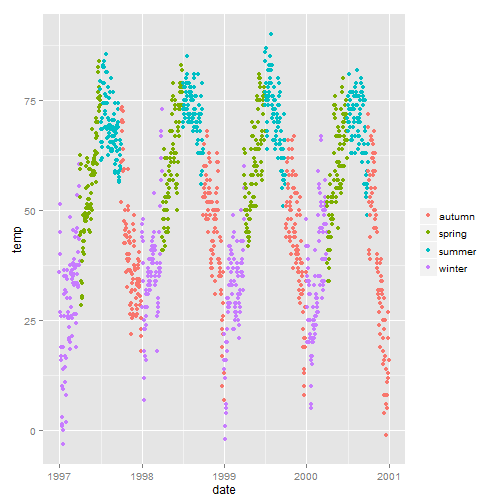 What are the updates to increase spacing between the axes and axis text? I hadn’t heard this, can you give me a link to where this is described? 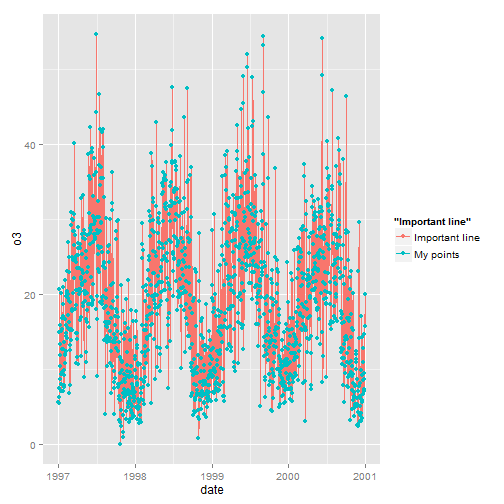 In any case, I’m likely going to need to do an update for ggplot2 v 2.0 because it has some nice new features. 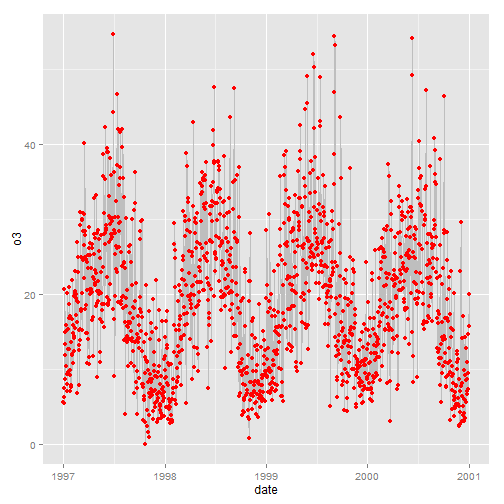 parameter is the correct way to solve this problem as of ggplot2 2.0.0. This is great! Thanks for the help, I have updated the post. really such a great tutorial! thanks. Is there any way to reverse the color drawn by scale_color_grey() from lightest to darkest? Also in scale_color_brewer(), in several theme (e.g. Blues), there is always the color very close to “white”. Is it possible to remove those colors for better visualization? Great tutorial, very clear and concise. Helpful, thanks. I find it useful to look at the default text margins to take as a starting point when adjusting. 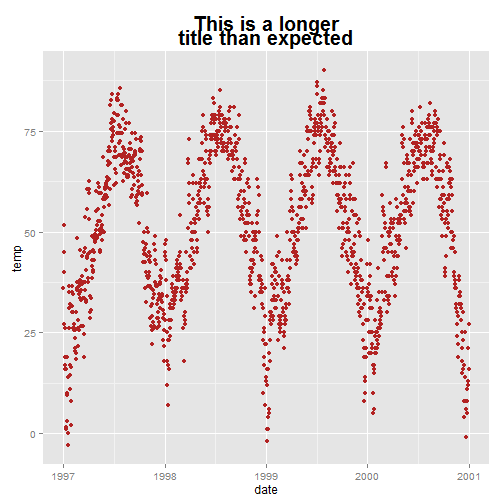 For example, the default plot.title margin (see theme_grey function) is margin = margin(b = half_line * 1.2), where half_line is half the base_size font, or in short the bottom title margin is .5*11*1.2 = 6.6 pt. I really appreciate you reporting this. The bad link must have been there for months! I’ve fixed it. 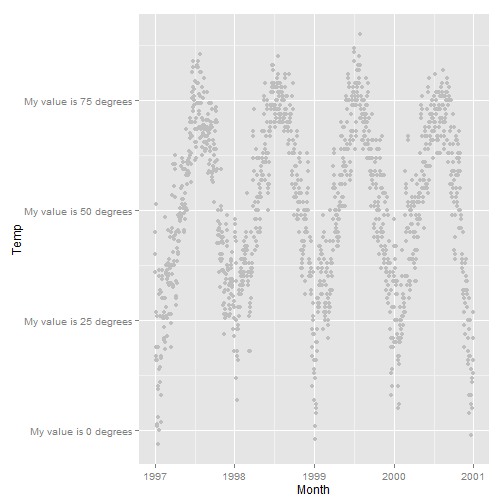 Is there any way to customize where the tick marks are along the x-axis? 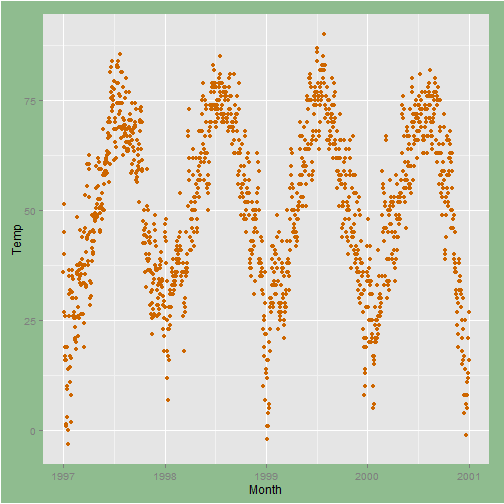 I have a time series, and I’d like to have major tick marks every January, then minor tick marks every quarter (every April, July and October). 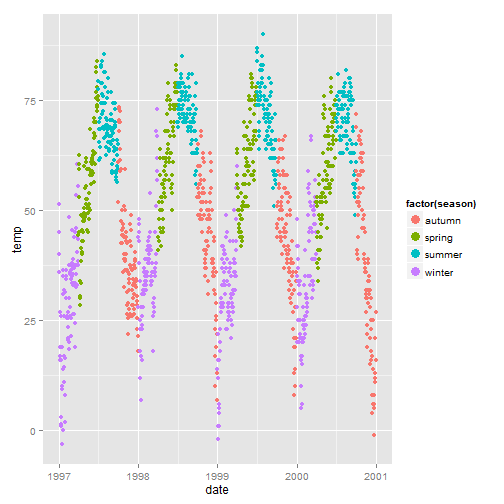 Preferably, I’d also like the labels to read “Jan 2012”, “Apr 2012”, etc instead of just the numeric year. This would take some work to get right given that you have a couple of different tick types and locations but you should take a look at scale_date (http://docs.ggplot2.org/0.9.3/scale_date.html). 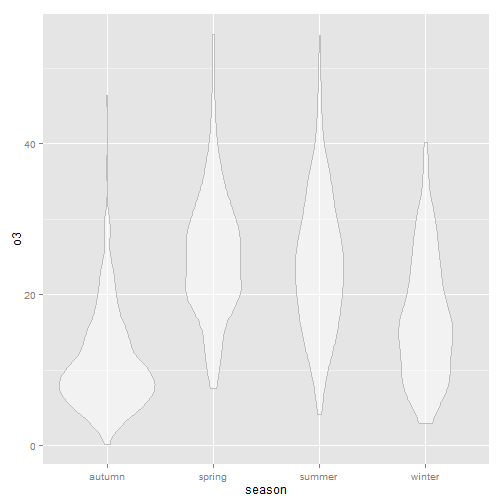 Hi there- Anyone else experience the problem on a Mac wherein the plots rendered always have grey lines in the background– that aren’t ggplot2 gridlines?? Unfortunatelly, I just found this site. It is very helpful. However, I hope someone here, can help me out. I want to annotate differing text to fix position on all facetted plots. However, it always annotates the first element to all plots. Best to see the whole code. Please post to stackoverflow and provide a link. I posted the problem to stackoverflow. I provided a link to another post and a gist that might help. Amazing cheatsheet. 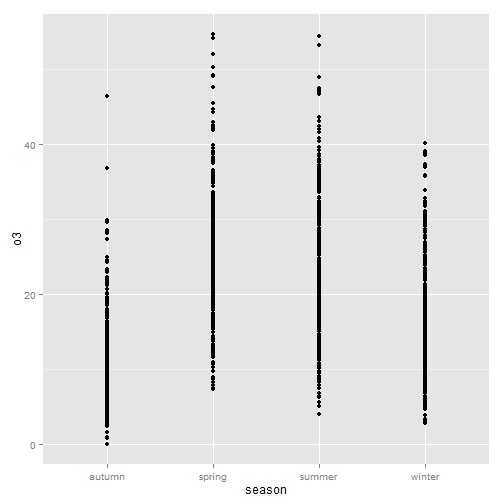 I’m new to ggplot2 and it would’ve made my day a lot easier if I had started here. Thanks for this post! 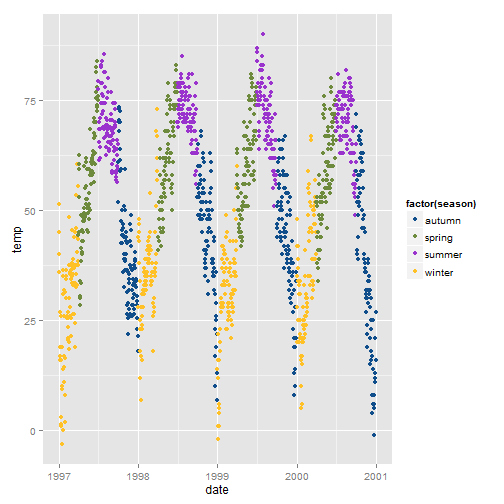 I inserted minor ticks in the y-axis of my ggplot graph without labels and I wanted it to be shorter than the tick marks with labels. Wondering how this is done in r or I am looking for a r code to do it. Thanks a lot. Off-hand I’m not sure. Perhaps feed a vector to the theme/axis.ticks.length. Why don’t you post code to stackoverflow and send the link. 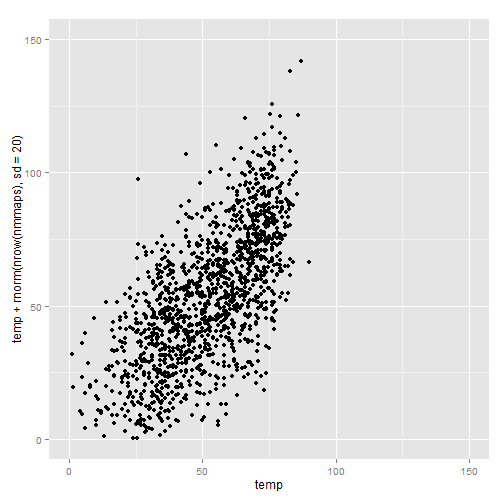 I have a small dataset (2 variables x and y, 15 instances), and would like a matrix of scatterplots y vs. x, y vs. log(x), y vs. sqrt(x), y vs. I(1/x), log(y) vs. x, log(y) vs. sqrt(x), …, I(1/y) vs. I(1/x). 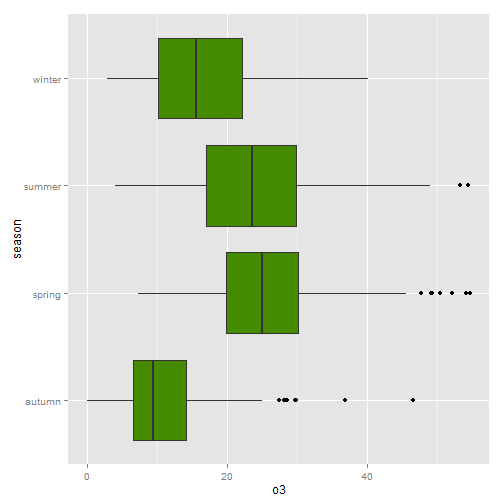 The ‘pairs’ command in basic R gives too much (I only want y or some function of y on the vertical axis). 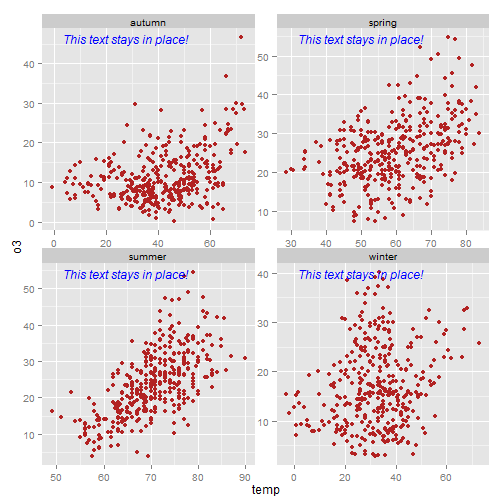 How can I get this matrix of 16 scatterplots using ggplot2? Such a plot is useful in searching for transformations of x and y so that the relationship is linear with constant variance (for an analysis using simple linear regression). Thanks! Question about the annotation with facet_wrap. Let’s say you didn’t want them all to say the same thing, but rather something specific per each grid. Can you do that? Yes, how to do it depends on what you’re trying to do. Probably the easiest thing is to have a new dataset that has the same variable you’re using to break on facets with the text you want. But, again, really depends on what you’re trying to do. 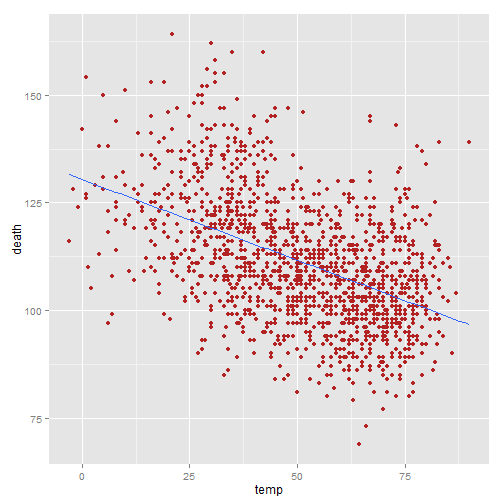 At this link (https://gist.github.com/kdauria/524eade46135f6348140) is an example of how to add a custom linear regression formula. Thanks for this! I’ve been searching for an answer to my legend issues for a while now. This is an excellent resource. Thank you for posting. I have a question about facet_grid(). 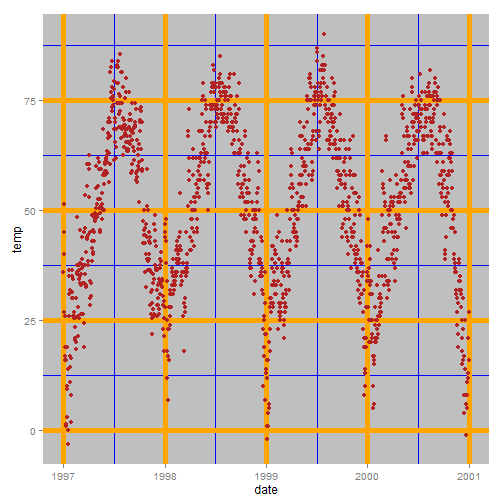 I am using it to plot 43 histograms. Everything works nicely, but all the histograms are printed next to each other in one long line. Is there a way to get them to print in 2 or 3 rows. Not with facet_grid() — the number of rows and columns is determined by your facetting variables. Try facet_wrap() instead with the nrow, ncol arguments. This is awesome! I want to have the title on the bottom? Can you help me with that? Sorry for the delay, did you get your answer? This is awesome especially for someone new in R like me! 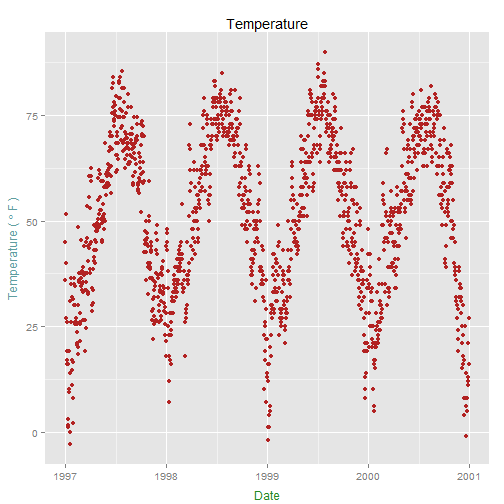 Excellent tutorial on graphing with ggplot!